With a proper and consistent diet and a clean, safe home your pet rabbit should be a happy and healthy pet. Unfortunately, even with the best of care, injuries and illness can occur. In the event of illness, contacting your veterinarian is always recommended. Rabbits are easily stressed and can become ill with any change in their routine or diet. Rabbits can be very sensitive to pain but often hide any symptoms of pain, injury or illness. Signs of illness or pain in your rabbit are limp when walking, hunched back, licking or scratching a particular area, lack of appetite, lethargy, heavy or fast breathing, grinding teeth or an inability to sleep. 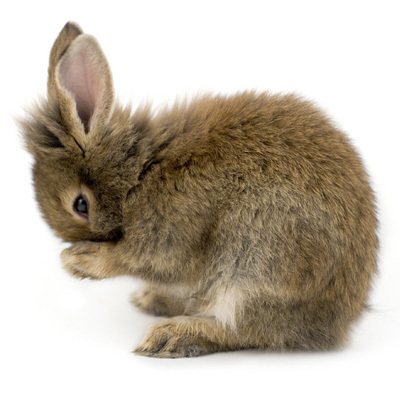 Below is a list of common problems that may arise with your pet bunny. Abscesses are painful pockets of infection under the skin. Symptoms are lumps under the skin and feel fairly solid. Abscesses must be drained or removed. If you pet has a received an animal bite you can clean the wound with soapy water. For insect bites, remove the stinger and apply a cold pack. Apply pressure with a clean, dry cloth until bleeding stops, being careful not to remove the clot. Stabilize the injured area. You may need to use tape to keep him from moving the injured area. Rabbits are very susceptible to heatstroke despite the ability to blow off heat through their ears. Symptoms of heatstroke are heavy breathing, lack of movement and elevated body temperature. Remove the rabbit from the heat source and submerge your pet’s body in cool water. Avoid exposure to heat and direct sunlight to prevent heatstroke. Mites are microscopic bugs that can live on different parts of your pets body and will need treatment from your veterinarian. Depending on the mite, symptoms can be dandruff, dry skin, head shaking, and scratching. Your rabbit’s teeth will grow continuously and if not worn down will overgrow which will interfere with your pets ability to eat. If this occurs you or your veterinarian will need try trim your rabbit’s teeth. Pasteurella is a bacteria common to rabbits. Rabbits that are carriers of this bacteria can go a long time without showing symptoms, are usually infected for life, and can easily transmit it to other rabbits. Symptoms are congested nose, nasal discharge, head tilt, twisted neck, runny eyes, skin infection, swelling under the skin, lack of appetite, difficulty breathing, depression and infertility. Most cases of red urine are caused by a plant pigment called porphyrin. This is not a reason for concern and the urine should return to yellow in a couple of days. The joint closest to the foot on the hind leg becomes reddened and the fur may be discolored. An open sore that can lead to infection and scabbing can be very painful. Sore hocks can be prevented by providing proper cage flooring, large enough cage space and controlling your pets weight. Female rabbits over four years old have a 50% chance of getting uterine cancer. Symptoms are aggression, vaginal bleeding, blood in the urine and lack of appetite. Spaying your pet between four and six months old can prevent uterine cancer. Warbles is a disease common to rabbits that are kept outside and exposed to flies. This is caused by a fly egg that invades the skin. You will see a swelling with an open sore in the center. The egg needs to be removed carefully to prevent infection or fatal toxic shock. Do not crush the egg. Warbles can be prevented by providing screened housing for your pet.